[Berkeley, CA] The Berkeley City Council will soon consider the Disposable Foodware and Litter Reduction Ordinance, the most ambitious and comprehensive piece of municipal legislation in the US aimed at reducing single-use disposable foodware. 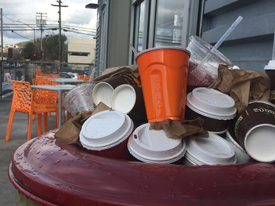 The “Disposable-Free Dining” ordinance will get its first hearing at the April 24 Berkeley City Council Meeting. At 3pm that same day, Mayor Jesse Arreguin, one of the authors of the legislation, will join business owners, residents, and local, state, and national nonprofits to hold a press conference at the Berkeley Recycling Yard, located at 1231 2nd Street. Click here for the Press Kit. Globally, single-use disposable foodware is contributing to plastic pollution in the world’s oceans, drinking water, and food. 80% of plastic found in the ocean come from land-based sources. Shoreline Cleanup volunteers collected 5,826 food wrappers; 2,156 straws and stirrers; 1,577 forks, knives, and spoons; and 3,269 foam packaging items from Berkeley, Albany, and Emeryville shorelines in 2016. Single-use compostable foodware made from paper or fiber presents other environmental dilemmas. The thin, plastic coating added to make some compostable foodware impermeable contaminates composting operations. Other compostable foodware uses fluorinated chemical (PFASs) to create a grease and water barrier. PFAS are highly persistent synthetic chemicals, some of which have been associated with cancer, developmental toxicity, immunotoxicity, and other health effects. PFASs in food packaging can leach into food and increase dietary exposure, and also persist in compost after the container decomposes. Berkeley’s Disposable-Free Dining ordinance builds on a long history of Berkeley initiatives aimed at phasing out products with high environmental costs, such as single-use plastic bags and polystyrene. The City of Berkeley is currently diverting approximately 75% of its discards and striving toward its goal of reaching Zero Waste by 2020. This entry was posted in Blog, Featured and tagged City of Berkeley, litter pollution, plastic, plastic-free, Press Release, recycling, water pollution, Zero Waste by Ecology Center. Bookmark the permalink. I am so pleased Berkeley will develop beginning standards for take-out food containers. I cringe when I purchase food placed in 1/2 pint plastic containers or more elegant dishware destined for the dump. While I reuse what I can, eventually it needs to be put into the recycling bin. I have brought back plastics to my favorite take out—Poulet and they have been happy to refill. Like my reusable shopping bags they will need to be stored in my trunk for ready use. It would be great for these businesses to promote reusables by signage or selling re usable take out like the utensil kits. Wouldn’t it be great if we had a better solution for take out at Trader Joe’s?